We've camped in many a desert during our travels. We've slept under the stars with nothing more than a rug and a thick blanket to block the wind in the White Desert of Egypt, Used our camel's saddle as a pillow in the Thar Desert of India and camped through the Nubian Desert of the Sudan and the Kalahari of Namibia with our state of the art North Face tent but we have never stayed in an actual Bedouin Camp set up as it would have been centuries ago. Check out Dave and Deb's Surreal Moments in Deserts Around the World for more desert adventures. In Wadi Rum, Jordan, we had our chance to sleep in a Bedouin Camp that felt as if we had stepped back in time. One could imagine the nomads from long ago setting up their temporary camp for a season as they made their way through the Arabian Desert. Captain's Desert Camp is designed to replicate an authentic Bedouin camp. We arrived at the Captains Camp after our jeep safari through Wadi Rum. As we pulled up to the tents, we were greeted with smiles from men enjoying tea around the fire. The camp is located in a spectacular setting. Built beside giant kharst like formation and surrounded by mounds of high rocky cliffs in the middle of the Arabian Desert we truly felt away from it all. Our tent was situated right beside said cliff and we knew we'd be protected from the wind and the cold of the desert night chill. Tents are made traditionally out of goat's hair with the desert sand as its floor covered in Jordanian carpets made of wool. Ours was a basic tent with bed, cozy blankets, a couple of chairs and a small light. 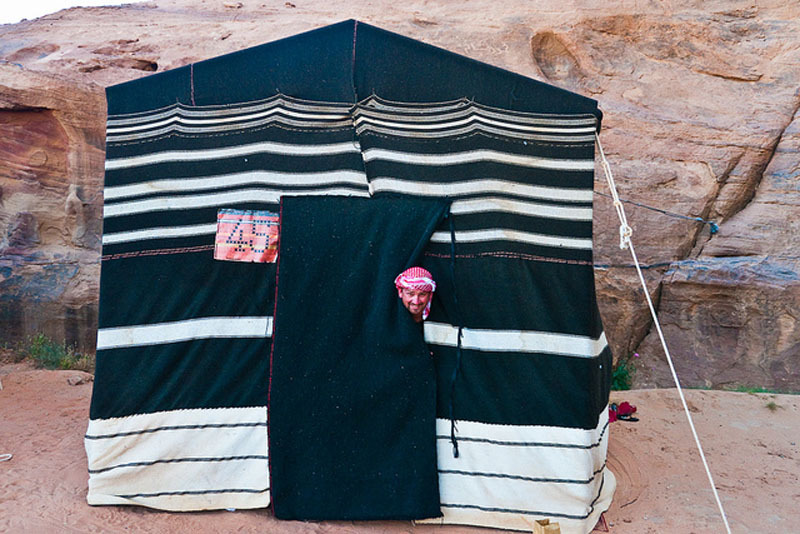 These bedouin tents are made with great skill by the women of the tribe. It takes 30 days to make a tent with several women working around the clock to complete it. Once the tents are finished, the goats hair is weaved together so tightly and skillfully that they are waterproof. They are also solid enough to protect from wind and sand. I can imagine these holding up just fine in a desert sand storm. After we settled in we made our way out to the back of the compound where we met a baby camel. Our driver Mahmoud had helped to give birth to a baby camel two weeks earlier and he wanted us to meet his new arrival. Mahmoud had the honour of naming the camel and he gave it the strong and regal title of Wolf; Diab in Arabic. Diab recognized Mahmoud immediately and ran up to say hello. Our days were jam packed in Jordan, and it wasn't long until we met up with our guide for a sunset camel safari. The landscape was stunning as expected, but the camel safari itself was disappointing. I would have liked our guide to be on a camel rather than walking in front of us on foot. We have been on camel safaris before and this one felt like nothing more than a pony ride at a fair, albeit set in a better location. The guide stumbled slowly along in front of us holding onto the camels reigns while we plodded along behind attached to one another. Within an hour we were out at a small mountain to enjoy the sunset. We didn't venture too far out into the desert and could still see our camp from our vantage point, but it made for a beautiful view. The desert lit up into different hues of orange and pinks as the sun set quickly over the rolling landscape. Unfortunately several jeep tours came whizzing into our serene scene to ruin the moment and blog the views. As the tourists noisily piled out of their trucks, I commented on how they managed to disrupt our quiet moment. They didn't seem to care. We walked high upon the rocks to gain an unobstructed view and enjoyed the warm glow of the sun reflecting on the rocky landscape. When we returned to camp we were treated to a feast and were invited around back to see the preparations. This is truly a special event for a Bedouin meal. Lamb, chicken, potatoes and vegetables are cooked in the earth making for the most mouth wateringly delicious meal you will ever have. It is difficult to put into words how they cook it and how much preparation goes into this, so we took some video to let you see the work that goes into preparations. After digging in and feeling completely satisfied, we joined the men outside by the fire where we drank tea and they passed around the Sheesha. We didn't last long as our day had been filled with excitement and adventure. It was time to tuck in for the night. The generators were turned off and the paths were lit by candles leading safely to the different sections of the camps. We slept peacefully dreaming of caravans and silk traders stopping in this same spot for thousands of years. 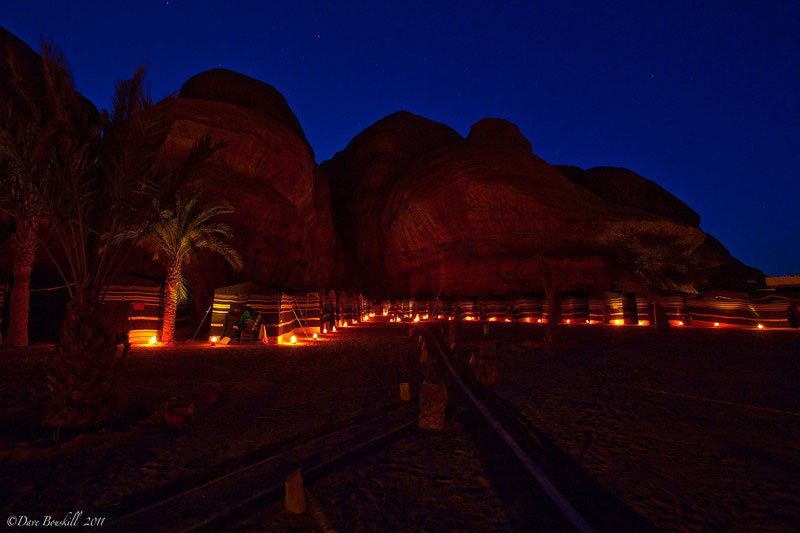 Captains Desert Camp is located in the Disi Area out side the Wadi Rum reserve. They offer: Desert jeep tours, Special Beouin Meals, Camel and horse tours, hiking trips and visits to Petra and other locations around Jordan. To find out more about Captain Tourist Services around Jordan visit their website. 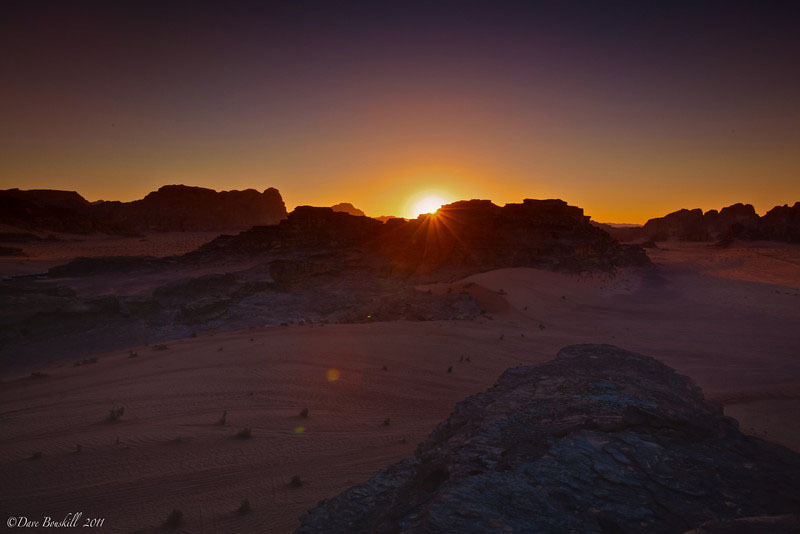 46 Responses to "Wadi Rum, Bedouin Camping and Camels at Sunset"
What wonderful photos! Camel ride is in my future. Thanks! Looks amazing. For a fact, I have never camped in a desert before. I only hear that it gets really cold at night. Hopefully I will try this one day. Hi David, yes it does get cold at night. When you camp in the desert, make sure to bring a hat and a warm sleeping bag. I hope you get to try it soon, it is spectacular. than x for the amazing pics, you make me proud that I’m from Jordan. this place is my favorite in Jordan, every time i go back to Jordan i have to visit this place that give me a relaxation and a push to go back to work. 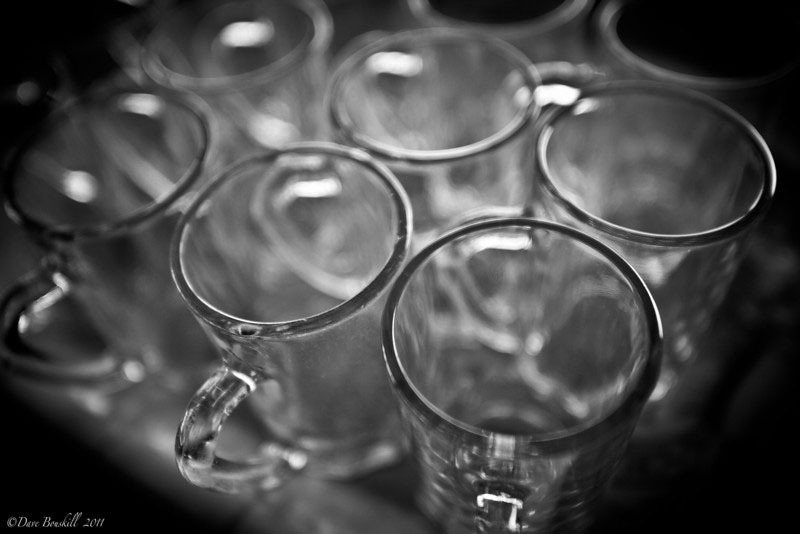 i would like to mention about the hospitality from the bedwen its not like any place you will visit. Hassan, thanks for stopping by and I am so glad that you enjoyed the post. We enjoyed our time in Jordan immensely and look forward to coming back in the future. Beautiful, as always. The Bedouin tents look amazing! Hey D. It was pretty cool to sleep in the Bedouin Tent, I always love sleeping in the desert. It is so quiet and the air is so clear. Nothing like it. Looks like an awesome experience! The baby camel is adorable! It looks and sounds so awesome! You had me a baby camel! That campsite looks unreal. You guys do the coolest things, such an inspiration. I kinda sorta camped this week … it’s got me thinking!! This place looks so magical – gorgeous photos! Shame about the camel ride…I would love to try that someday! 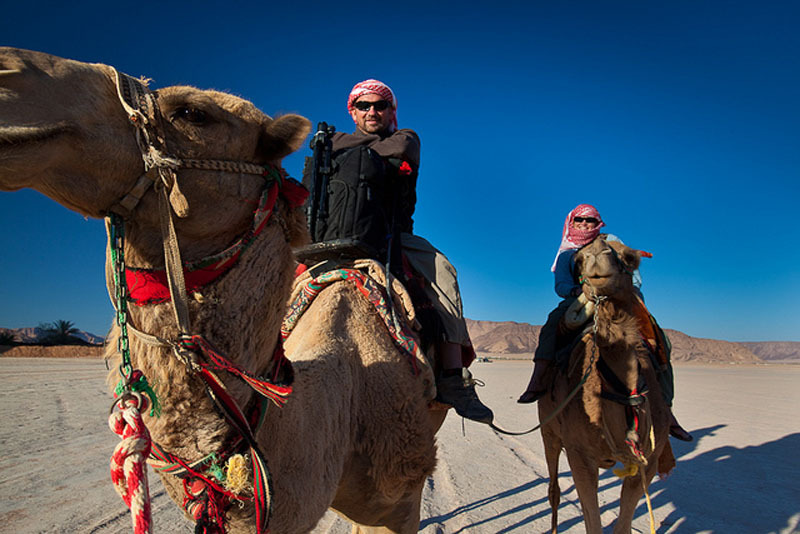 The good news is, you can definitely book a better camel ride in Jordan. This was to just give us a taste, but we didn’t understand why they would send us on such a mellow one knowing our background. For some people, a quick ride to a sand dune could be enough, not for us. However, I don’t think that anyone would enjoy the trucks pulling up. That was just annoying. We went to see a woman speak that said she spent 2 weeks on a camel safari in Jordan. Now that’s an adventure. Lovely photos as always! We were there too on our recent trip to Jordan and kidlet adored the baby camels we saw. That food cooked under sand was delish, we also lucked out with a full moon after our sunset. I guess in this shrinking, modern world it is as much a matter of what a visit brings to the experience as it is how ‘authentic’ the total experience is. I am sure the tent repaid looking at it closely, smelling the material, seeing the stars. I am sure you got the best out of it – and that baby camel is the cutest! You are absolutely right David. You can’t go into travel looking for an authentic situation anymore. You just have to look for a good experience. The world is getting busier and busier. Thanks Lorna, it was fun. There’s nothing like sleeping out in the desert. I would love to spend a night in the desert, I’ve been to a safari in Abu Dhabi and India, the Thar Desert, but never stayed overnight. Apart from the camel safari itself, it does look like you’ve had a lovely experience. Angela, yes, you do have to stay overnight in the desert soon. The skies are so clear and you can see millions of stars. The air is fresh and it is silent. It is amazing how much the temperature drops too. It never ceases to amazing me on how drastically the weather can change from day to night. Looks lovely and sounds like a great experience. Jordan is high on my travel list! Cheers Dean. I hope you make it to Jordan soon, you’ll love it. Wow, that looks amazing! I really want to check that out. Thank Essaldeen. Yes, I do believe that Captain’s Camp is considered one of the best in Wadi Rum. The staff was very friendly and helpful. We had a great time! Oh! The photos are gorgeous as always!! I am amazed at the skill that you mentioned. The tent is waterproof? Wow!! I think we can learn a thing or two from them. Looks like a great adventures! Yes, the Bedouin tents are waterproof. They can hold rain and snow. We think that it is when they build the fires inside that they are truly waterproof. Bedouin families do all their cooking in the tents so the ash builds on the roof sealing the hair. It sounds like a rather commercial spot, what with jeeps whizzing in and kitchen chairs in the tent and a “pony ride” camel ride. But you certainly made the most of it and your photos are absolutely gorgeous! Hi Vera, Thanks for the heads up on the comment luv. We’ll check it out. Maybe something went wrong with the update. Yes, it is a bit commercial, but then on the other hand, it is very quiet compared to other popular tourist spots in other countries. There were only about 40 people at sunset as opposed to hundreds at Angkor Wat and in our camp there were only about 20 people staying at our camp. Unfortunately the world is shrinking, but if people work on keeping things small and quiet like so much of the companies in Jordan, it makes the experience more pleasant. My biggest complaint was the trucks pulling up to sunset. They should have at least had to park down below and walk up to at least keep the facade that we were in the middle of the desert. Maybe they will crack down on the guys that pull right up and ruin the moment if more people say so. This looks like so much fun! I love that they light the paths with candles. That is something that we loved about Jordan. Petra at night was lit by candles in paper bags as well. It seems like a traditional way of lighting paths. I am not sure, but we saw it a lot in Jordan. Sooo gorgeous! And the baby camel is beyond cute. Seriously, you should submit the wee camel pics to the Daily Squee and Cute Overload. Adorable! Thanks, we’ll do that. It is at Tourabsurd? 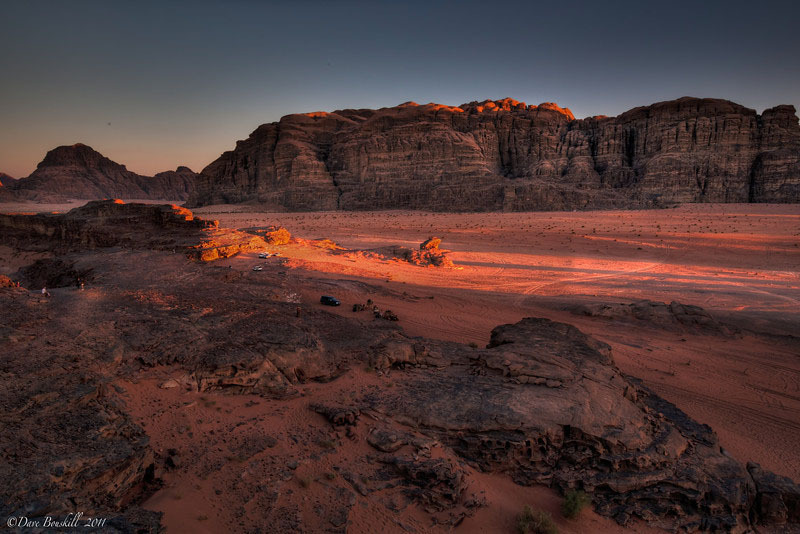 Wadi Rum looks beautiful! Sounds like you packed a lot of adventure into your stay. 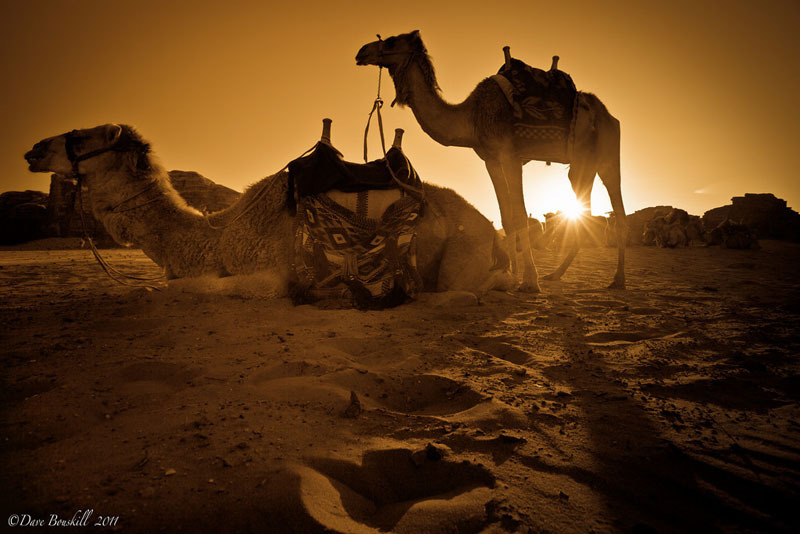 Where did you go on a camel ride the first time around? We went on one in Egypt and in India twice. In India, we road our own camels. We made sure to ask about that because in Egypt we had the guy walk in front of us and hold onto the reigns just like here in Jordan and we didn’t find that very much fun. It is better when we can follow along in a camel train when the guide is on a camel as well. It feels more authentic. Other tours did have their guide on a camel so it is possible to do that here. Thanks Trisha, and as I said to Leslie, you can book your own camel safari and ask all the right questions. I would also go for a longer one. This was more like a camel sunset walk, if we were doing it on our own, we would book an overnight safari into the desert. But, we can’t complain, this gave us a great taste of Wadi Rum. 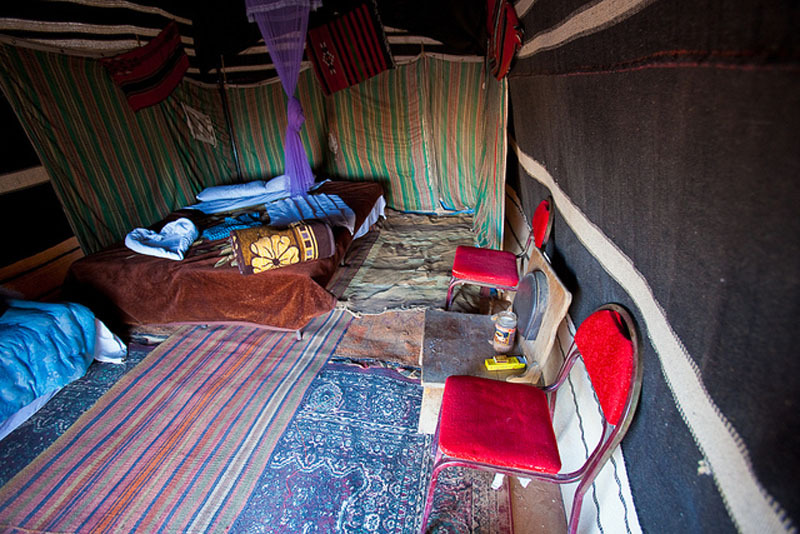 There is nothing like chilling with some tea and soul food in a Bedouin camp…. They now how to relax after a long day. That is the truth Forest. They work so hard all day in the desert, they deserve a nice break at night.